Google and Marvel Studios have collaborated for the studio's upcoming blockbuster Avengers Endgame with exclusive Playmoji pack on Pixel 3 phones. Google will be sending help to the Avengers in their battle against Thanos and has revealed that "something big is coming to the Pixel universe" on May 8. With Google's ARCore at the helm of affairs, Pixel 3 users will be able to manifest five new Playmoji character from the Marvel Cinematic Universe which includes Black Widow, Captain Marvel, Thor, Rocket and War Machine. 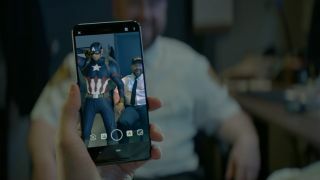 The characters can be added to different scenes when creating a picture or video from Pixel 3 and ARCore optimizes the augmented reality elements. Google's annual developer's conference, Google I/O is scheduled to begin on May 7 and it is rumoured that the company will be unveiling their new Pixel 3a series during the event. We already know that Google has teased something for the Pixel universe that indicates a possibility that we might see the mid-range Pixel phones after all.